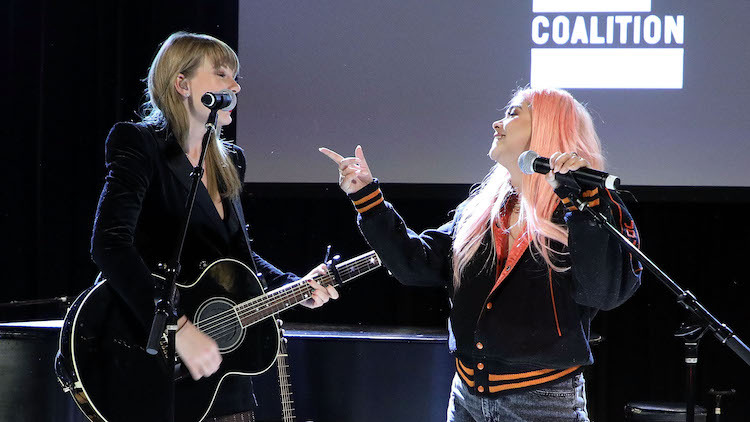 Swift performed with Lesbian Jesus at the Ally Coalition Talent Show. Taylor Swift is solidifying her status as an ally. She recently urged her fans to vote in the midterm election, a move not like her usual anti-political stance. And last night, she turned her sights to her LGBTQ+ fans with a surprise performance. Swift took the stage with Kiyoko, and they did a duet of “Delicate” from Swift’s Reputation. This officially makes the song a queer bop in the eyes of our lord, Lesbian Jesus. Kiyoko recently performed with Swift on the Reputation tour. There, they did a duet of “Curious” from Kiyoko’s Expectations. Perhaps we can hold out for a proper collab between the two in 2019, which Twitter has all but officially dubbed #20biteen, in response to Kiyoko’s #20gayteen. Founded by Jack Antonoff, the Ally Coalition seeks to end LGBTQ discrimination by highlighting systemic inequality and supporting LGBTQ youth. The show also featured performances by Antonoff, Regina Spektor, and Lana Del Rey.